Why Every Coach, Parent, Teacher and Manager Needs a Motivational Plan. One of the most important things I have learned is that every coach, supervisor, teacher and parent needs a motivational plan. Motivation is critical and the key to success. Motivation is what makes us want to do things. It is the difference between doing something with enthusiasm, giving 100% and having a good attitude, or just doing the minimum with a bad attitude. List - First, make a list of the actions and behavior you want. (Make a list of the actions and behavior that will lead to the results you want. If, for example, you want your players or students to improve, your list might include practice, listening to the coach or teacher, hustle, perseverance, a positive attitude and doing their best. Those are fundamental habits and a way of approaching a task that will benefit them for their entire lives. Examples in soccer might be hustle, bravery, defense or specific actions such as following shots for rebounds or for midfielders to run back to a defensive position when your team loses the ball. Do NOT put results such as scoring a goal on the list because that is NOT specific enough. You MUST train them to consistently do the things that will RESULT in success. Success results from doing the right things with the right attitude. Incentivize - Second, incentivize your players by showing them the rewards they can earn. Start to encourage your players and show them the patches they can earn - the patches are an incentive and will motivate your players. Praise - Third, praise them every time they do what you want so they are getting praise AND feedback that they are doing the right thing. Give SPECIFIC praise in front of the rest of the team if possible. (See below for How to Give Effective Positive Encouragement and Praise That Gets the Results You Want). Reward - Fourth, when they do the right thing, reward them with a patch at a ceremony in front of the team and, if possible, the parents. This is positive reinforcement and a visible reminder of the rewards they will receive if they please the coach. (See below for more about how to give the patches in a ceremony). Coming to practice is critical, so you want to motivate and reward that. It will be a huge advantage if all your players come to practice. That is the only way to practice as a team. Create a Patch Motivational Program prior to giving out any patches. List the behaviors that will be awarded, how to earn them and show a picture of the patch. (You can copy and paste the pictures from SoccerHelp). Provide a copy of the Patch Motivational Program to the parents and players. This is essential so that players and parents understand the purpose and motivation behind the system. Be sure to buy enough patches. You should be able to estimate how many of each kind you will need by considering the number of games and practices. Use the patches to motivate and reward INDIVIDUAL IMPROVEMENT, EFFORT and ATTITUDE. There are certain things players can do and can't do. Every player can try their best, hustle, be brave, have a good attitude, listen to the coach and gradually improve. BUT, every player isn't fast or a great athlete. That is the problem with giving a MVP patch for Rec games - the best athletes will probably win it every time and the kids who aren't great athletes probably don't have much of a chance. Soccer is a team sport and it is important that all your players improve. In fact, it will probably help your team more if your weak, timid players improve than if your great athletes improve because "Weak" links are usually what hurt a Rec team the most. Make a List of the Specific Individual Improvements You Want to Encourage From Each Player. Typical things might be Bravery, Hustle, Listening to the Coach, Playing Your Position, Defense, etc. That way you can look for improvement by each player. Tell the kids what you would like to see them improve in and if they improve, give them a patch and praise them. Try to find a reason to give EVERY player a patch. Continued individual improvement is your goal. Remember: Soccer is a team sport and it is important that all your players improve. In fact, it will probably help your team more if your weak, timid players improve than if your great athletes improve because "Weak" links are usually what hurt a Rec team the most. Giving a MVP Patch is a Bad Idea for Rec Teams and Can Cause Hard Feelings in Any Team Sport. The reasons are stated in no. 5 above. Be careful about giving MVP patches - they give the impression that one player is more important than the others and that can only lead to disagreement and hard feelings. It is VERY hard to decide who is the MVP in a team sport such as soccer. Your Plan Needs to Be Specific to Your Team. Every team is different. A Rec team will have a different plan than a Select Team. It is best if every child who attends a Rec game gets a patch. Remember, you are playing Rec soccer and it is supposed to be fun! If you don't give every kid a patch, the players who don't get one will feel left out and could develop negative attitudes and ill-will towards the coaches and other players. You might not want to give one to a player who was at the game but didn't try, but here is a way to handle that -- you could give a black soccer ball patch to the kids that don't earn any other type of patch. There are many different kinds of patches and some are cooler than others. That allows you to designate special patch for specific actions. For example - a lightning bolt for hustle and a "C" for courage, D for Defense, A for Attitude, etc. ONLY give those if they are earned. That does NOT mean you have to give every kid an attendance patch for just showing up for the game - you would only give that to kids who didn't earn a patch for improvement, effort or attitude. Develop a Plan. Think through what you want to motivate and use the patches to motivate and reward your players. 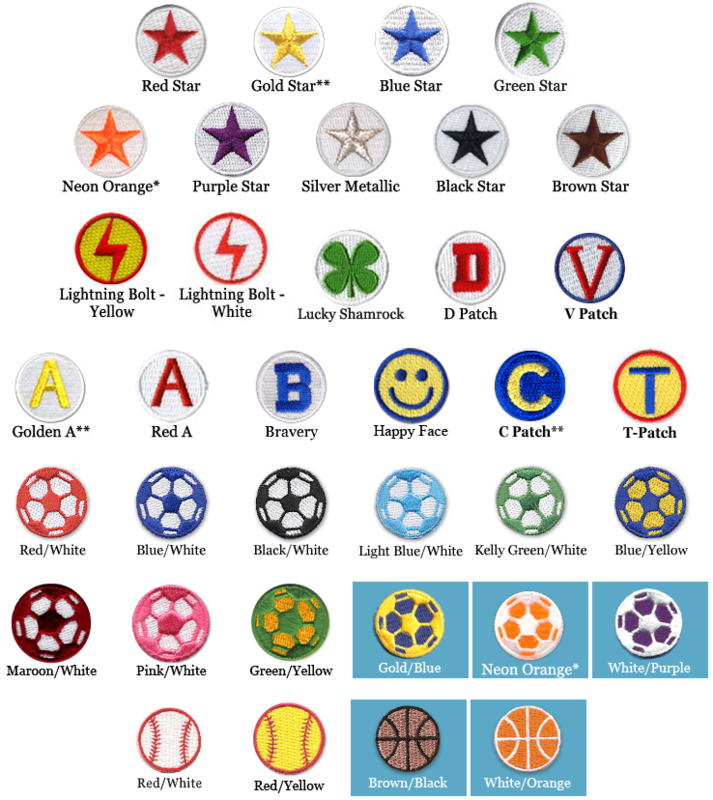 The iron-on patches are used for soccer, baseball, basketball, martial arts, swimming, skating, band, volleyball and other sports. They are also used by schools, churches and clubs. Give them in a Ceremony in Front of the Team and Parents. For the best results, keep in mind the benefits of public praise, competition and group pressure. Everyone loves to be praised in front of a group and it is natural for kids to want to earn something that their teammates have earned. That is why it works best to give the patches out after the game in a ceremony in front of all the players and parents and be sure to PRAISE the players and tell them why they EARNED the patches. This will make them proud and will let the other players know the type of behavior that will EARN a patch. Positive Reinforcement. A positive reinforcement approach gets better results than a negative approach and is a lot more fun for everyone. Visible Symbols. The soccer patches really work to motivate players and for positive reinforcement. They are a visible symbol. The Iron-on Patches Are an Incentive, Positive Reinforcement and Motivation to Both the Player Being Rewarded and to Others Who See the Patches and Want to Earn Them. The patches are an incentive to motivate the behavior you want and when you give a player a patch it is positive reinforcement and a visible symbol that the player has done a good thing and was rewarded. Other players will know how the patches were earned and will be motivated to please the coach and earn patches. Encourage and praise the actions and behavior that you want from your players in a positive way and use the player's name. If it is something they did such as hustling, you can say "Great hustle Billy." But if it is something you want them to do, instead of saying something negative such as "Billy you have to play harder", try a positive approach such as "Billy, I know you can do it" and praise every small step of improvement Billy makes. Give your players lots of encouragement and praise in a visible way so other players and parents see it or hear it. Give praise for actions you are encouraging at the time they happen. Give your praise in a way where everyone sees it and hears it so your players know that you are proud of them and the other players know what they can do to earn praise. When a player does something you want them to do during a game or during practice (like bravery, hustle or great defense), get their attention and yell something like "Good job Sam", smile and make a hand gesture like a thumbs so they can see you are pleased. You might even tell them before the game that if they do something great that you will give them a "thumbs up". Think about the SPECIFIC positive words and actions you want to use to praise and motivate your players. Remember that you need to be specific both in what you want to encourage AND when you give praise. For example, if a player does something brave during practice and a game, and you can get their attention just after that, you can say "Way to go" or give a thumbs up and they will associate the praise with their behavior. An example of Positive words and Negative words. Think about the words that can get the best results. For example, every coach wants his or her players to be "aggressive", but "aggressive" has a negative connotation. Many parents discourage "aggressive behavior". I think it is better to use the word "brave" than "aggressive". Heroes are brave and everyone thinks bravery is a good thing. I think "brave" gets better results than "aggressive" because kids want to be brave. Why the word "Brave" is better than "Tough" or "Aggressive" -- We have been told by many coaches that "Brave" is a much better word to motivate players than "Tough" or "Aggressive". A lot of parents don't like the idea of a coach encouraging their kid to be "tough" or "aggressive", but everyone wants to be "Brave". Brave is a lot more positive word. Also, think about what the words convey - Heroes are Brave and the word "Brave" conveys an image of a hero. But "tough" conveys an image of a fighter or a villain. You will get better results using the word "Brave". We are coming out with a special "B" for Bravery patch. If you wait until half time or after the game to give praise, you need to be specific about what you are praising. For example, say "Great defense Kate" instead of "Good job Kate", so Kate knows what you are praising. If Kate did something specific that you want to encourage, be even more specific so Kate know specifically what you are praising. For example, if Kate is a midfielder who has been good about attacking but has been slow to run back to help defend after losing the ball, you might say "Kate, you saved a goal. That was great defense when you ran back to defend." Remember - you want to encourage and reinforce SPECIFIC behavior, so be specific and say it loud enough that other players hear your praise, that is part of your positive reinforcement and motivation plan.